Accessories: Accompanied by Certificate of Origin dated January 10, 2018, setting pin, sales tag, sales receipt, product literature, wallet and presentation box. 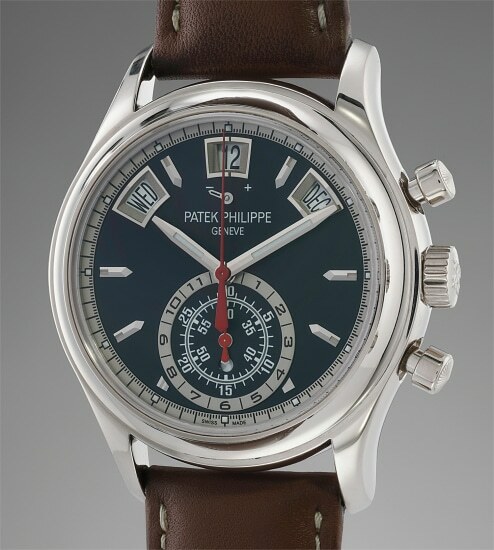 First introduced in 2006, reference 5960 was Patek Philippe’s first self-winding chronograph wristwatch with an annual calendar complication. The reference was first launched in platinum with grey dial. Patek Philippe later released variants in pink gold and stainless steel. The latest iteration features a white gold case with blue dial, giving it a sporty and novel appearance, which at the time of cataloging, is still in current production. Offered in excellent condition, this timepiece is replete with all its original accessories such as the sales tag, Certificate of Origin dated January 10, 2018, fitted presentation box and setting pin.